Teens love nothing more than a good dystopian novel (I may be wrong about that). You really don’t have to work too hard to sell them. 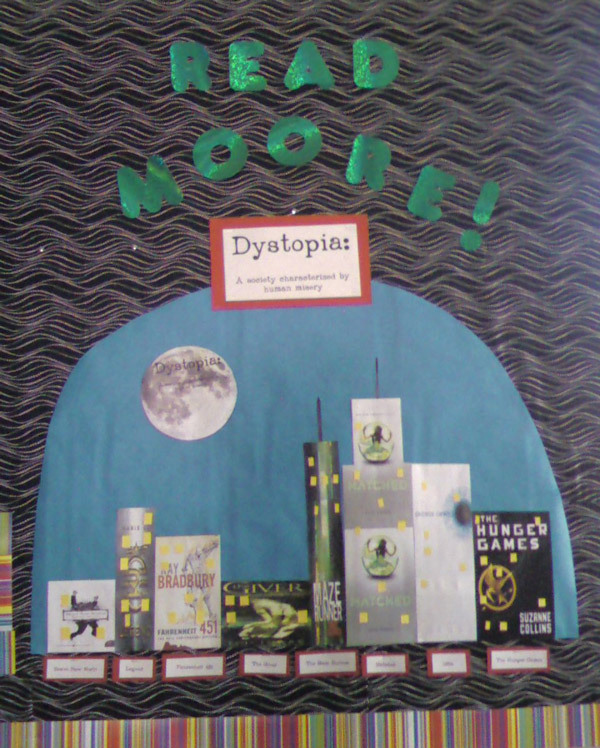 But I still enjoyed creating this dystopic literary display. I simply stretched and squished my selected book cover images in Word until they worked together to my liking (I googled city skyline first so I would have a general idea of the sizes I wanted to create). Then I cut out some little yellow rectangles to look like windows. Finally, I cut out a semicircular (semi-ovular?) piece of blue butcher paper and put it all together under an ominous moon. And voila. A one stop bulletin board for teens hungry for another creepy dystopian tale to reinforce their subconscious belief that the man is trying to control them. ← Guilty of loving a good mystery?